The Cimarron is an intimate tailwater fishery issued from Eagle Nest Dam and Lake, flowing eastward through the Cimarron Canyon State Park. The river is located in the northern part of the Sangre de Cristo Mountain range and is a very productive fishery partly due to the consistent water temperature from the bottom of the lake. The Cimarron River emanates out of Eagle Nest Lake and Dam in Northeastern New Mexico. Located on the eastern edge of the Sangre de Cristo Mountains, this dry fly gem flows eastward along US Hwy 64. After flowing into several other rivers this water ultimately reaches the Mississippi River. New Mexico Game and Fish(NMGF) estimates nearly 4,000 catchable sized wild browns per mile, unquestionably the healthiest wild brown trout fishery in the state and one of the healthiest in the southern Rocky Mountains. Most of the wild browns are 10-14 inches with the occasional big boy. NMGF stocks 8-12 inch rainbows during the summer months as part of a put-n-take program. Ten miles of trout water are open to the public. 8 miles of water flows through the Cimarron Canyon State Park, the other 2 miles are private only accessible via guide trips. The state park water begins at the US Hwy 64 bridge just upstream of Tolby Campground and ends at the eastern edge of the state park just west of the small community of Ute Park, NM. The 2 private miles are located on two different pieces of private land. The first section, the Holy Water, is the 3/4 of mile of water flowing out of Eagle Nest Lake and Dam. The other 1.5 miles known as the Dream Water is located just east of Ute Park, NM. All of the Cimarron River from the eastern edge of the state park down-stream is private. The Cimarron averages 10-15 feet wide and 1-3 feet deep with every imaginable water characteristic. Fast riffles, deep runs, bend pools, undercut banks, spring creek like channels, pockets and beaver pools can be found within several hundred yards of each other. The one constant factor on this free-stone like tail-water are the willow, alder, cottonwood and pine trees lining the river. The water in the Cimarron is primarily used by ranchers and farmers down river. The irrigation season runs from May through September when flows can range from 10 cubic feet per second(cfs) to 70 cfs, optimal fishing flows range between 15 cfs -50cfs. Tight casting quarters and ever changing water features challenge flyfishers of all skill levels. The best technique involves quietly wading up-river making short roll casts underneath overhanging branches. Rods should be 7-8.5 foot, 2-5 weights. Hip waders with felt soles are ideal for the rocky streambed. No need to worry with long leaders, 7.5 foot leaders work. The big advantage on the Cimarron is the diverse insect population the brown trout thrive upon. From April through September anglers can see atleast 5 different stonefly hatches, 11 different caddisflies and countless different mayflies along with midges and a host of terrestrials. A thick Golden Stonefly (Hesperoperla pacifica) hatch begins in early June moving up river through June into early July. During this hatch 80-100 fish days are possible. In July numerous species of mayflies hatch, the caddisflies quickly follow in late July. The abundant insect hatches combined with the shallow water makes the Cimarron a premier dry fly fishery. There is a Special Trout Waters section on the Cimarron River. In an effort to help maintain this fabulous wild brown trout fishery please release all brown trout. Great dry fly fishing can be had as early as April, but the best starts in early June when the stonefly hatch begins. The browns let their guard down, often taking large dryflies during this hatch. By mid July the caddis begin showing their presence and the browns slash for escaping caddis. The best flows to fish the Cimarron are between 15-50 cubic feet/second. The Cimarron has an abundance of hatches in the spring and summer with nymphs that crawl the river bottom and banks all year long. The fish are small but abundant. The stream is heavily stocked with rainbows but there are a lot of wild browns and cutthroats. Portions of the river flow though beaver ponds where midge emerger and pupae patterns are the order of the day to catch some 18″ wild browns. The Cimarron holds an incredible insect population. Caddis, stoneflies, and mayflies are abundant. In addition, the upper reaches hold scuds, a small crustacean that wash down out of the reservoir. Fish orange and olive scud patterns, especially during high water, in the upper reaches of the stream. The most exciting hatch of the season comes in late May when stream flows stabilize. The large Golden and Orange Stoneflies begin to hatch lower in the canyon and gradually work their way upstream. This hatch lasts well into July. Keep your flybox stocked with all the standard western imitations for the summer and early fall hatches. You’ll find them all. In late fall the browns begin their spawn and can be taken with large streamers and egg patterns. The river remains fishable until the water is shutdown in late October when it is too low to fish effectively. The first half-mile below the dam is private and can only be accessed by permit. About a mile downstream of Eagle Nest Lake, Tolby Creek feeds the Cimarron River. Traveling on US 64 east, from Eagle Nest Lake, the river parallels the road most of its way to the town of Cimarron. Three miles east of the confluence of Tolby Creek, Clear Creek flows into the Cimarron just below Cimarron Canyon Spring. These feeder creeks hold small cutthroats. The river continues by Ute Park, through private property and then on through the town of Cimarron. This stretch holds wild brown trout but, you must obtain permission to fish. The Holy Water is the approximate half mile of water immediately below Eagle Nest Dam. The lower half features a long sweeping beaver pool. Moving upstream, toward the dam, characteristics change from slow waters to fast riffles and runs. Both private stretches have additional rod fees. The Dream Water, approximately 1.5 miles long, flows through a meadow scattered with willow and cottonwood trees. The Cimarron River’s elevation drops, almost like an escalator in a department store, as it cuts through the narrow canyon on its way to Ute Park. In turn, the stream structure carries riffles, undercut banks, pools and some deep holes. The abundant vegetation such as overhanging willows makes casting, for the novice, difficult. Fishing from the middle of the stream makes the casting easier but don’t forget the proper fishing etiquette as you approach other anglers. Short casts and drag-free drifts are important on this stream and when the water is crystal clear a low-profile position is a must in order to catch fish. 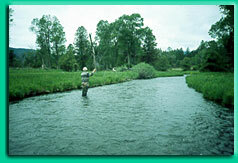 The river is an excellent dry fly and nymph fishery for about 8 miles to the community of Ute Park. There is parking and turnouts through the area, before reaching Ute Park, with campgrounds for those who want to camp. There are special regulations in the Colin Neblett Wildlife Area portion, which is managed by the New Mexico Department of Game and Fish. The river is fishable in early spring, but can be very low and challenging. Stream flow runs as low as 5 CFS in the late fall and winter until runoff in June when it can shoot up to 170 CFS. The river usually levels out by the end of May in the 20 to 60 CFS range. 30 to 40 CFS is ideal. At this level the fish spread out across the runs and riffles leaving the confines of the deep holes and cutbanks. The river is heavily fished and during the summer months irrigation requests raise the water considerably at times. Checking the river flow is always wise. See my water flow link Current New Mexico Stream Flows. Even with the heavy fishing pressure, as it is, you can always find a place to float or sink a fly on the Cimarron River. Use short, lightweight rods. Ideal is an 8′ 4wt, but many use 7’9″ 2wt’s. Rods longer than 8′ are very difficult to handle in the tight, brushy confines. Use 7’5″ leaders in the 4x to 6x range, depending on water level and clarity. Take US 64 from Taos and travel east and north to the town of Eagle Nest continue east on US 64 or take the Cimarron-Eagle Nest exit of I-15 north of Santa Fe. I am not a newcomer to New Mexico. During the past 25 years, I have fished many of the state’s waters. Some of the fisheries in the northern portion of the ”Land of Enchantment” are personal favorites. Each summer, I visit the region to enjoy cool days combined with excellent fishing. With the South Plains’ recent scorching temperatures, last week seemed like the perfect time to make the trip. Because I already know of some good fishing holes in the state, I am usually reluctant to attempt to discover any new ground. My attitude on this matter is: If it’s not broke, why fix it? With the limited time I get to spend in the mountains each year, I like to make every second count toward hooking that trophy trout. However, on this trip, I took some advice from an old fishing buddy and decided to try something new. The place was a stretch of the Cimarron River just below Eagle Nest Dam known as the ”Holy Waters.” My fishing partners for the afternoon were my eldest son and renowned New Mexico fly-fishing guide, Doc Thompson. In recent years, I have heard so much about the excellent trout fishing on the Cimarron that I just had to give the fishery a shot. With all the major bug hatches on the river – from caddis to stonefly – the place is supposed to be a fly-fisherman’s dream, and I figured that even a club-handed fly caster such as myself could make a pretty fair hand with the aid of a top-notch guide like Doc. Of course, as with most fishing trips that I have planned, the weather tried to do its best to kill the bite. On the day we arrived, the mercury was well into the 90’s, and I did not get a single trout to rise on the first evening. But on the second day, the heat subsided and my afternoon on the ”Holy Waters” was like something out of an Ernest Hemingway novel. My son and I caught and released fat brown trout all day long, and the back drop of the Carson National Forest made the trip one I will never forget. As for the flies that brought us the greatest success, there really seemed to be no particular pattern. Whether I tied on a high-floating #12 Renegade or tight-lined a #24 Zug Bug, this particular stretch of protected water produced strike after strike. And as for our guide, just let me say that it is quite an experience to fish with Doc Thompson. The guy has been fishing the area for 10 years, and his knowledge is uncanny of not only the Cimarron but also other decent fishing waters in the northern portion of the state. While there, Doc also took us to the famous Philmont National Boy Scout Ranch and showed us the sights. As an Eagle Scout, Doc knows the ranch well and worked at Philmont for nine summers before deciding to guide fishermen around for the wild trout of the Cimarron. On our final evening, as the last brown trout was guided toward the net, I realized the Cimarron River was truly a little slice of heaven and another special fishing hole that would hopefully see the bottom of my waders for many years to come. Believe me fly-fishing in the shade of the tall pines is a good way to wind up a long hot summer. The Cimarron River is certainly a special place that promises not to leave the outdoorsman disappointed. 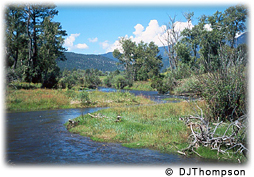 For information about the Cimarron River contact the New Mexico Fish and Game Department at 1-800-ASK-FISH. For more information about a guided fishing trip on the ”Holy Waters,” contact Thompson at (505) 376-9220. (Mike Bowlin is a longtime Lubbock resident with an extensive background in hunting and fishing. His column appears each Sunday in The A-J sports section).